Dynamics of flexible fibers in viscous flows and fluids. Annual Review of Fluid Mechanics. Annual Review of Fluid Mechanics (2019) Vol. 51:539-572. The dynamics and deformations of immersed flexible fibers are at the heart of important industrial and biological processes, induce peculiar mechanical and transport properties in the fluids that contain them, and are the basis for novel methods of flow control. Here we focus on the low–Reynolds number regime where advances in studying these fiber–fluid systems have been especially rapid. On the experimental side, this is due to new methods of fiber synthesis, microfluidic flow control, and microscope-based tracking measurement techniques. Likewise, there have been continuous improvements in the specialized mathematical modeling and numerical methods needed to capture the interactions of slender flexible fibers with flows, boundaries, and each other. Permalien | Commentaires fermés sur Dynamics of flexible fibers in viscous flows and fluids. Annual Review of Fluid Mechanics. The deformation of a flexible fiber settling in a quiescent viscous fluid. The equilibrium state of a flexible fiber settling in a viscous fluid is examined using a combination of macroscopic experiments, numerical simulations, and scaling arguments. We identify three regimes having different signatures on this equilibrium configuration of the elastic filament: weak and large deformation regimes wherein the drag is proportional to the settling velocity as expected in Stokes flow and an intermediate elastic reconfiguration regime where the filament deforms to adopt a shape with a smaller drag which is no longer linearly proportional to the velocity. Permalien | Commentaires fermés sur The deformation of a flexible fiber settling in a quiescent viscous fluid. 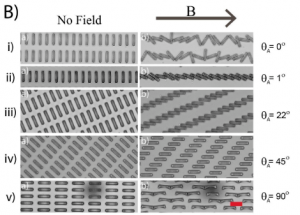 Morphological transitions of elastic filaments in shear flow. The morphological dynamics, instabilities, and transitions of elastic filaments in viscous flows underlie a wealth of biophysical processes from flagellar propulsion to intracellular streaming and are also key to deciphering the rheological behavior of many complex fluids and soft materials. Here, we combine experiments and computational modeling to elucidate the dynamical regimes and morphological transitions of elastic Brownian filaments in a simple shear flow. Actin filaments are used as an experimental model system and their conformations are investigated through fluorescence microscopy in microfluidic channels. Simulations matching the experimental conditions are also performed using inextensible Euler–Bernoulli beam theory and nonlocal slender-body hydrodynamics in the presence of thermal fluctuations and agree quantitatively with observations. We demonstrate that filament dynamics in this system are primarily governed by a dimensionless elasto-viscous number comparing viscous drag forces to elastic bending forces, with thermal fluctuations playing only a secondary role. While short and rigid filaments perform quasi-periodic tumbling motions, a buckling instability arises above a critical flow strength. A second transition to strongly deformed shapes occurs at a yet larger value of the elasto-viscous number and is characterized by the appearance of localized high-curvature bends that propagate along the filaments in apparent “snaking” motions. A theoretical model for the as yet unexplored onset of snaking accurately predicts the transition and explains the observed dynamics. We present a complete characterization of filament morphologies and transitions as a function of elasto-viscous number and scaled persistence length and demonstrate excellent agreement between theory, experiments, and simulations. Permalien | Commentaires fermés sur Morphological transitions of elastic filaments in shear flow. Assembly Modulated by Particle Position and Shape : A New Concept in Self- Assembly. Materials in Special Issue ”Designed Colloidal Self-Assembly”, 10, 1291. In this communication we outline how the bespoke arrangements and design of micron-sized superparamagnetic shapes provide levers to modulate their assembly under homogeneous magnetic fields. We label this new approach, ‘assembly modulated by particle position and shape’ (APPS). Specifically, using rectangular lattices of superparamagnetic micron-sized cuboids, we construct distinct microstructures by adjusting lattice pitch and angle of array with respect to a magnetic field. Broadly, we find two modes of assembly: (1) immediate 2D jamming of the cuboids as they rotate to align with the applied field (rotation-induced jamming) and (2) aggregation via translation after their full alignment (dipole-dipole assembly). The boundary between these two assembly pathways is independent on field strength being solely a function of the cuboid’s dimensions, lattice pitch, and array angle with respect to field—a relationship which we capture, along with other features of the assembly process, in a ‘phase diagram’. In doing so, we set out initial design rules to build custom made assemblies. Moreover, these assemblies can be made flexible thanks to the hinged contacts of their particle building blocks. This flexibility, combined with the superparamagnetic nature of the architectures, renders our assembly method particularly appropriate for the construction of complex actuators at a scale hitherto not possible. Permalien | Commentaires fermés sur Assembly Modulated by Particle Position and Shape : A New Concept in Self- Assembly. Scientific Reports 7: 15688 | DOI:10.1038/s41598-017-15638-5. 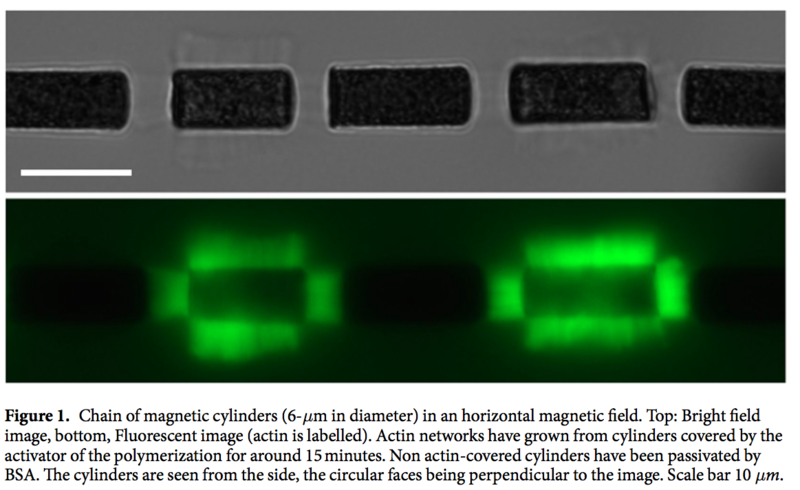 We measured mechanical properties and dynamic assembly of actin networks with a new method based on magnetic microscopic cylinders. Dense actin networks are grown from the cylinders’ surfaces using the biochemical Arp2/3-machinery at play in the lamellipodium extension and other force-generating processes in the cell. Under a homogenous magnetic field the magnetic cylinders self-assemble into chains in which forces are attractive and depend on the intensity of the magnetic field. We show that these forces, from piconewtons to nanonewtons, are large enough to slow down the assembly of dense actin networks and controlled enough to access to their non linear mechanical responses. Deformations are measured with nanometer-resolution, well below the optical resolution. Self-assembly of the magnetic particles into chains simplifies experiments and allows for parallel measurements. The combination of accuracy and good throughput of measurements results in a method with high potential for cell and cytoskeleton mechanics. Using this method, we observed in particular a strong non linear mechanical behavior of dense branched actin networks at low forces that has not been reported previously. Fluidization, a process in which a granular solid phase behaves like a fluid under the influence of an im- posed upward fluid flow, is routinely used in many chemical and biological engineering applications. It brings, to applications involving fluid–solid exchanges, advantages such as high surface to volume ratio, constant mixing, low flow resistance, continuous operation and high heat transfer. We present here the physics of a new miniaturized, microfluidic fluidized bed, in which gravity is replaced by a magnetic field created by an external permanent magnet, and the solid phase is composed of magnetic microbeads with diameters ranging from 1 to 5 μm. These beads can be functionalized with different ligands, catalysts or enzymes, in order to use the fluidized bed as a continuous purification column or bioreactor. It allows flow-through operations at flow rates ranging from 100 nL min−1 up to 5 μL min−1 at low driving pressures (<100 mbar) with intimate liquid/solid contact and a continuous recirculation of beads for enhanced target capture efficiencies. The physics of the system presents significant differences as compared to conven- tional fluidized beds, which are studied here. The effects of magnetic field profile, flow chamber shape and magnetic bead dipolar interactions on flow regimes are investigated, and the different regimes of operation are described. Qualitative rules to obtain optimal operation are deduced. Finally, an exemplary use as a platform for immunocapture is provided, presenting a limit of detection of 0.2 ng mL−1 for 200 μL volume samples. Fibers are widely used in different industrial processes, for example in paper manufacturing or lost circulation problems in the oil industry. Recently, interest towards the use of fibers at the microscale has grown, driven by research in bio-medical applications or drug delivery systems. Microfluidic systems are not only directly relevant for lab-on-chip applications, but have also proven to be good model systems to tackle fundamental questions about the flow of fiber suspensions. It has therefore become necessary to provide fiber-like particles with an excellent control of their properties. We present here two complementary in situ methods to fabricate controlled micro-fibers allowing for an embedded fabrication and flow-on-a-chip platform. 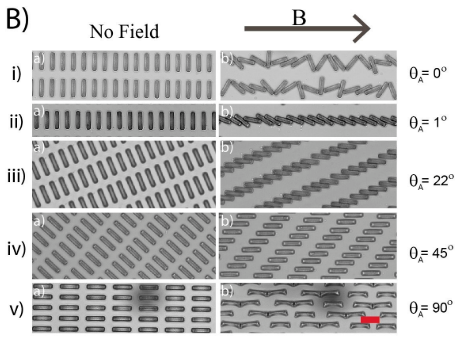 The first one, based on a photo-lithography principle, can be used to make isolated fibers and dilute fiber suspensions at specific locations of interest inside a microchannel. The self-assembly property of super-paramagnetic colloids is the principle of the second fabrication method, which enables the fabrication of concentrated suspensions of more flexible fibers. We propose a flow gallery with several examples of fiber flow illustrating the two methods’ capabilities and a range of recent laminar flow results. Tavacoli, J., Brown, A., Bauër, P., du Roure, O., & Heuvingh, J.
SEM image of a spontaneously-formed ring. the diameter is 10 µm and the thickness is sub-micron. 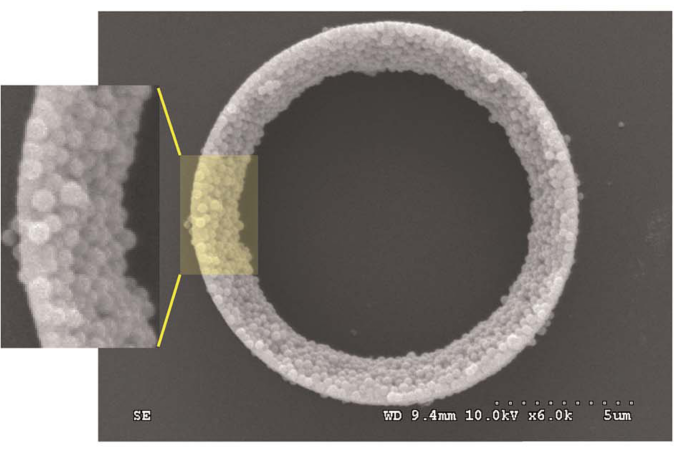 We report the spontaneous formation of rings when a colloidal dispersion, containing silica-coated iron-oxide particles and the liquids ethanol and ethoxylated trimethylolpropane triacrylate, is deposited within micron-sized PDMS wells. Just after filling, the interface between air and the dispersion is a meniscus dictated by the dispersion’s contact angle on PDMS. Upon evaporation of ethanol the meniscus lowers and, if a critical volume is reached, a rupture process is initiated and the dispersion adopts a ring morphology. The final dispersion consists only of particles and ethoxylated trimethylolpro- pane triacrylate that can be reticulated to solidify the ring geometry. The colloidal particles within the dispersion are essential for the stability of the rings prior to the reticulation. Here, by using iron-oxide based colloidal particles we fabricated superparamagnetic rings, opening up newavenues for applications. The dimensions of the rings can be tuned by adjusting both the size of the PDMS wells and the amount of ethanol in the dispersion. In this manner it is possible to fabricate rings with annuli smaller than a micron – a scale below the lower limit of standard lithography. Calculations assuming an equilibrium contact angle of ethoxylated trimethylolpropane triacrylate on PDMS reproduce the experimental results strikingly well. Permalien | Commentaires fermés sur Force-Velocity Measurements of a Few Growing Actin Filaments. Permalien | Commentaires fermés sur Impact of branching on the elasticity of actin networks.